Coffee drinkers can be faced with challenges to get a cup of coffee at times. Generally, there is an espresso shot provider on every other city block corner. Being in the woods, camping, can present some challenges though. When the need arrises, the only real mountain to climb is the hot water part of the coffee. The rest is just an opportunity to be creative. For me, spending the night at a friend’s house that doesn’t drink coffee is more of a reality. Sure, it’s hard to believe that I hang out with anyone that doesn’t know their way around an espresso machine, but I never think to ask when forming friendships. I used to carry a little hand-pump pressure coffee maker, but found I most often didn’t need it. Now, just a bag of the latest fun beans are packed in the luggage. The biggest hurdle is hot water. So, when at someone’s house, the rest is no problem… well, not as impossible like when there is no hot water. 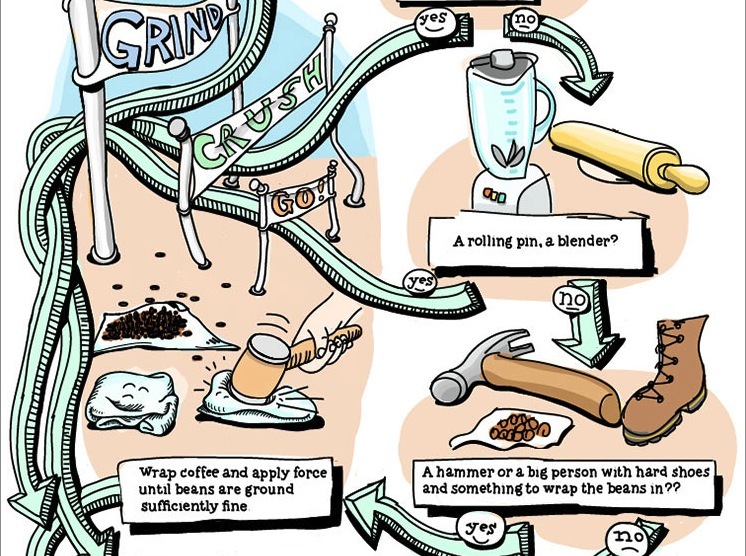 This all came top-of-mind today when Tonx mentioned they had a fun infographic about this exact challenge… how to make coffee when there is no coffee maker available! Remember Tonx? The subscription coffee bean company that brings our household beans from all over the world. Thus, we have hand picked flavors from around the world, helping to expand our enjoyment of beans from places we may not have otherwise thought of visiting. The infographic is part of the Tonx Coffee Hacks contest. I have not seen the other entries, but this one really hits home. There are a lot of options once you look around to get beans into grounds as well many ways to filter the goodness from the grinds into you cup. The infographic will be a handy reminder of some options when realizing your ‘friends’ doesn’t share all of your likes. Some people look at coffee and think that little has changed in the last 40+ years. Then, you see this video and remember how really different ‘coffee’ and the preparation of coffee was back in the early 60s. People thought of why they drank coffee differently. They had a different persecutive on what made a ‘good cup of coffee’. And one of the biggest differences is how they made their coffee. We have actually spent the last few years collecting many of the methods they show here, even the unique and very fun containers for the process to be proper. Whether you were drinking coffee in 1961 or even born then, this is a fun video to have an appreciation for where we are now. Now, with little pucks of processed ground beans, we are waiting forever as the machine does it’s thing in less than two minutes.